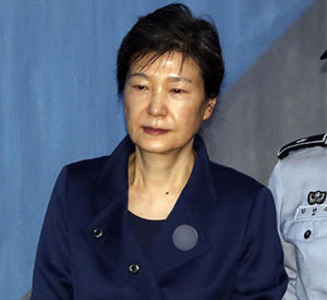 The pre-judgment detention period of ex-President Park Geun-hye in her appeals trial on corruption charges expired Tuesday night, but she stays under lock and key because she is serving another jail sentence. A suspect can only be detained for a maximum of six months before judgment is passed. In theory she would have to be set free, but she is also serving a two-year jail sentence that has not been appealed after being found guilty last November of interfering in her party's nomination of candidates who were running in the general election in 2016. Normally Park would now be moved from a remand prison to an ordinary jail and required to work like other convicts, but a Justice Ministry official said she is excused both indignities. The only thing that will change is her prison uniform, from a yellowish green for remand prisoners to a bluish green for convicts. 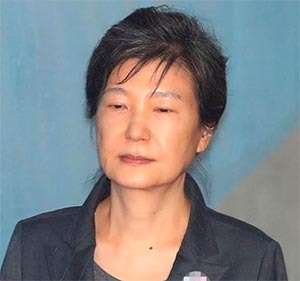 A source at a correctional facility said Park is allowed to exercise outdoors for an hour like other detainees and "is being fed appropriately." She was sentenced to 25 years behind bars last year for corruption, influence-peddling, bribery and other charges and waived her right of appeal, but prosecutors appealed the sentence as too low.